Hysterectomy is performed when a woman is suffering from conditions such as fibroids, uterine prolapse, endometriosis, chronic pelvic pain, vaginal bleeding and cancer of uterus among others. Depending on the severity of the condition the hysterectomy can be partial or complete which involves removal of uterus. Hysterectomy has various side-effects associated with it. These include hormonal imbalance, inability to conceive and disappearance of menstruation among others. To overcome these effects alternative methods are currently being adopted by the gynaecologist. These include myomectomy, uterine artery embolization, hysteroscopy, endometrial ablation and hormonal treatments. Globally, rise in gynaecological problems in women is the major driver for alternative hysterectomy market. Inefficient treatment through hysterectomy would also drive the growth of this market as it leads to side effects such as hormonal imbalance, rise in infection rates and mood swings. However, lack of proper funding and government regulations may restrain the growth of the market during the forecast period. This report identifies the global hysterectomy alternatives market size in for the year 2014-2016, and forecast of the same for year 2021. 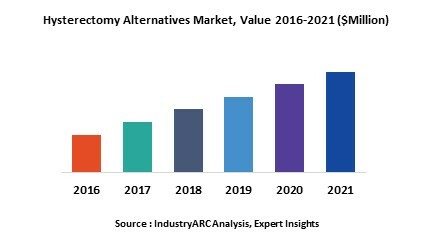 It also highlights the potential growth opportunities in the coming years, while also reviewing the market drivers, restraints, growth indicators, challenges, market dynamics, competitive landscape, and other key aspects with respect to global hysterectomy alternatives market. Geographically North America is estimated to dominate the global hysterectomy alternatives market, and is projected to have fastest growth, owing to higher accessibility and prevalence of gynaecological diseases. North America is estimated to be followed by Europe and Asia-Pacific. Non-Invasive procedures are estimated to witness a higher growth during the forecast period.